Țuică (Romanian pronunciation: [ˈt͡sujkə]; sometimes spelled tuica, tzuika, tsuika, tsuica, or tzuica) is a traditional Romanian spirit that contains 28–60% alcohol by volume (usually 40–45%), prepared only from plums. Other spirits that are produced from other fruit or from a cereal grain are called "rachiu" or "rachie". Traditionally, țuică is prepared from early October until early December (after winemaking is complete). The process must generally be finished before Christmas, so as not to leave unfinished business for the next year. If using plums, they must be left for fermentation (macerare) for 6–8 weeks, in large barrels (butoaie or căldări). Most țuică is moonshine, prepared using traditional methods both for private consumption and for sale. Although this was illegal in the past, the government tolerated the practice due to the traditional character of the beverage. Most țuică is sold in markets and fairs, and at roadsides, bottled in unlabeled PET bottles. Some communities have acquired production licences and produce it legally. A famous type is "țuică cu fruct." This is a glass bottle of țuică containing a whole fruit (usually an apple or a pear). It is obtained by hanging empty bottles on trees in spring or early summer and growing the fruit inside the bottle. The generic term "țuică" comprises plum brandies (jinars, horincă, cocârț, tura) and other fruit brandies. A specific nomenclature was created for țuică, comprising varieties such as old, selected, superior, etc. Normally, țuica is only consumed before the meal (traditionally every meal). 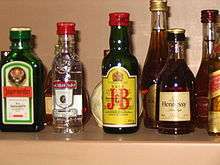 In most cases, only a shot-sized amount is served, and it is generally sipped. The drink is also present in all traditional parties (agape) such as weddings, baptisms, hunting parties, harvest festivals, religious holidays, family reunions, and wakes. In most of rural Romania, țuică is the usual drink to hold a toast with, rather than wine, which is almost always consumed towards the end of the party. Usually it is drunk before a meal, as it increases appetite. A modern portrayal of a modern village inhabitant almost always includes a bottle of țuică. Production of țuică can amount to up 5 litres per family per year, as the plum tree is the most widely present tree in Romanian orchards (see also Agriculture in Romania). According to the 2002/2003 census, 143,167 farms had plum trees bearing fruit covering a total area of 554 km². According to the same census, about 75% of the crop ends up as țuică. Romania is among the top Plum producers in the world, and the majority of this production is transformed into țuică.